After receiving feedback from MSHA representitives, customers, and independant trainers, we’ve added Presenter Mode to Convergence Training Viewer. Presenter mode takes advantage of our high-quality training, but gives trainers a tool to use in group settings such as classrooms, meetings, or presentations. Presenter Mode will enable Convergence Training Viewer to be used by students to take self-paced computer based training, but will also allow independent trainers to take advantage of our product to train one or many clients. Presenter Mode is slated to be released the second week in December. Stay tuned for further updates including screenshots and a How-To for Presenter Mode. We went through our Surface Miner Training curriculum and pulled a video from each module. We have updated our YouTube channel (http://www.youtube.com/kdellavalle) to include all of these video samples. The samples show the type of content that we produce and show how much more interesting and engaging our training is versus the other MSHA training out on the market. If you are sick of videos from the 1980’s and 1990’s being out of date, old, and unprofessional, I suggest taking a look at our samples. For even more details, you can download Convergence Training Viewer for free and install a fully featured demonstration version of our Surface Miner Training curriculum. Today, we have released a new and improved version of Laser Safety. This module is part of our Environmental, Health and Safety course library. The Laser Safety module covers laser light, how lasers work, types of lasers, laser classifications, laser hazards, low-power laser hazards, and laser pointer safety guidelines. Reference: STD 01-05-001 – PUB 8-1.7. The course includes 16 minutes of training and is now being offered for $39.00 for use in Convergence Training Viewer and is competetively priced per user for use in SCORM compliant LMSs. You can see a video preview of the module on YouTube here: http://www.youtube.com/kdellavalle. You can also download CTV and have a 5-day free trial of the module. Next week (week of 12-8-08), representatives from Convergence Training (Roman Battan, Director of Sales, and Randy Kohltfarber, Director of Product Development) will be on the road visiting existing and potential future customers in New York and Wisconsin. If you are in the area and are interested in speaking with a Convergence Representative, you can give us a call toll-free at 1.888.634.7346. As 2009 ramps up, it’s time to get the safety manual out and dusted off for another year. Schedule the overtime, print the packets, and warm up the PowerPoint presentation right? WRONG! Although classroom training or facilitating a safety meeting is a simple process, there are many hidden costs that are consistently overlooked. The most notable expense is overtime wages. In most cases, overtime wages do not directly affect a department manager’s annual operating budget. Because safety compliance training is required and is a justifiable part of operation; the cost burden is shifted to HR as a wage expense. This allows departments to continue on as usual and eliminates further accountability for recurring annual overtime expenses. In addition, it also removes the incentive for department heads to seek more efficient ways to deliver training. What’s wrong with Paying Overtime? Safety is a pressing issue in manufacturing and training the workforce on overtime has emerged as the best known cost alternative compared to halting production. Shutting down operations to deliver training could cost millions of dollars per year, so a few hours of overtime makes sense right? WRONG! Most overtime wages are paid at a rate of 1.5 times the hourly rate for non-salaried employees. When multiplied over hundreds or thousands of employees throughout the year, the expense begins to balloon very quickly. Also, as annual wages increase, so does the cost of providing training to the workforce. In the long-run, paying overtime will prove to be cost prohibitive. How Expensive Can it Really Be? From these three contributors, we can begin to put together an analysis and see how the cost of safety training really adds up. As an example, let’s take a company with only 200 non-salaried employees that have a safety meeting that lasts for one hour per month on overtime hours. Let’s assume an average hourly wage of $17.00, which would put their overtime rate at $25.00. Just for one hour per month, the annual cost per employee is $300. Three-hundred dollars doesn’t sound like a lot, but for a 200 employee site, the expense is $60,000 per year and an astounding $300,000 after 5 years. These figures don’t account for the cost of employing a trainer, potential workforce wage increases, or record maintenance and storage expenses. Over the last decade, communication has become lightning fast. Internet connections have higher bandwidth capacity, software designs are more focused and refined, and real-time data tracking is a standard part of operations. It is no wonder that the next wave in work-force education is web-based training. Delivering training over the web enables companies to significantly reduce overtime expense and more efficiently deliver and track employee learning with very little required resources. How Much Cheaper Can it Be? Having a web-based system allows the workforce to access training virtually any time during their shift by simply logging into a network computer. This means that employees can complete their required training during breaks or downtime, this eliminating the need for managers to schedule overtime wages for annual, semi-annual, or quarterly refresher training. 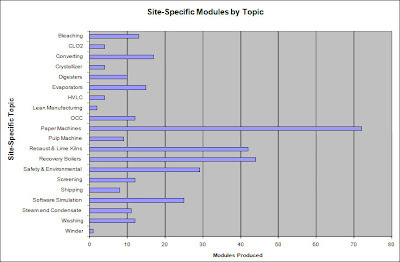 Training content delivered over the web can vary in price depending on which vendor supplies the training. The quality of web-based training is a subject for an entirely different article, but to provide a meaningful comparison, lets assume that a system capable of training 200 employees with 12 hours of safety training costs around $50,000 up front. This seems like a big one-time expense, but the cost averaged over 5 years is only $10,000 per year, vs. $60,000 per year of overtime training. The cost savings over the 5 years would be approximately $250,000. In reality, not all classroom training can be eliminated by implementing an online training system. Depending on utilization rates, savings can range anywhere from 30% – 80% of the cost of overtime-based training. These modules are all part of our Environmental, Health and Safety (EHS) package that contains 28 modules of content dedicated to OSHA, EPA, NIOSH, ANSI, and other regulatory agencies. We have been recently upgrading our material with additional regulatory information, new and more realistic virtual environments, and improved multimedia testing and progress reviews. With the release of these 6 courses, the EHS package is almost complete. As of now, individual courses can be purchased for a low price, and soon the entire package will be available at a savings off of the individual prices. To see a list of currently available courses, check out our website here or view our online store here. All of our EHS courses are made available using Convergence Training Viewer – a free desktop application that quickly and easily delivers training and allows updates to content, certificate printing, and basic reporting. Our courses are also available on DVD by request. Contractor Training has been officially launched and is being offered at 10% off for the remainder of the year. Our contractor training solution allows you to deliver and administer a flexible, efficient, and cost-effective internet-based training program. Convergence Contractor Training employs a web-based software and hosting system to provide training to visitors who need it. This means your time and resources can be dedicated to the operations of your facility and the safety of your co-workers by eliminating the repetitive, in-person training for multiple contractors and visitors. We have developed Convergence Contractor Training for clients who have struggled with the high costs, increasing volume, and logistical difficulties of training contractors, visitors, and vendors on-site. Deliver consistent, effective training across the internet allowing contractors to complete their required training off-site. Offer real-time notification of completions. Include flexible and intuitive reports that can be viewed any time to determine any contractors status. Stay tuned in the coming weeks for more information and the official release of Convergence Contractor Training. In the mean time, contact our Director of Sales, Roman Battan, at rbattan@capstonetechnology.com. Convergence Training is a division of Capstone Technology. Convergence and Capstone were established to provide pulp and paper mills with software solutions that increase efficiency and reduce operating costs. Our founders and subject matter experts began their careers in the pulp and paper industry, hold various degrees in pulp and paper and chemical engineering, and are uniquely suited to provide software solutions for the industry. Convergence Training began operations as a department within Capstone Technology in 2002. Since then, Convergence has authored more than 80 courses composed of 350 web-based training modules for pulp and paper, construction, mining, and automobile manufacturers. Our courses cover a variety of topics including regulatory information for government agencies such as MSHA, OSHA and the EPA, site-specific modules on pulping and papermaking processes, lean manufacturing fundamentals, equipment training, and software simulations. Although we’ve created training materials for many industries, Convergence Training has retained the company’s original focus, creating more than 70 percent of our site-specific modules for pulp and paper clients. Chart A below summarizes our production for those clients. In addition to site-specific training modules, Convergence offers a comprehensive library of training modules for standard business needs, including OSHA compliance (8 hours) and MSHA Part 46 training (8 hours). Convergence also offers solutions to deliver training materials, track employee’s training progress, create training reports, and archive training records: the web-based Convergence Training Server, our robust Learning Management System that can be scaled on an enterprise level; and the lightweight Convergence Training Viewer, for companies that want to deliver high-quality training with minimal tracking or reporting functionalities. We discovered an issue today caused by a recent update to Windows Media Player. The result is that upon launching a course (Electrical Safety for example) the Loading dialog stays visible and never receives the End Buffer event. The result is that the video is invisible (under the Loading dialog) but the audio can be heard playing in the background or the Loading dialog stays up and remains at 0% and never plays. For any users experiencing this issue, please send an email to support@thinkconvergence.com and we can send you a fix. Convergence Training, a division of Capstone Technology, announces the introduction of Convergence Training Viewer, a free, downloadable training access portal specifically designed to view interactive training media. Convergence Training Viewer provides virtually anyone, anywhere, at anytime access to a catalog of computer-based health and safety training modules developed in compliance with federal MSHA and OSHA standards for industrial, governmental, and higher education purposes. within a single software application. 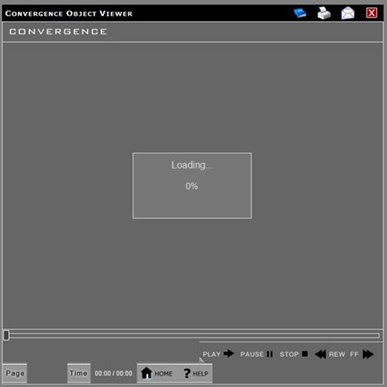 Convergence Training Viewer was developed to meet the needs of an evolving computer-based training market. While training managers have come to expect more dynamic and interactive training material, much of the industry has failed to keep up technologically. For example, online training may satisfy some customers but bandwidth constrictions continue to plague users with low quality video and limited visual content resulting in a diminished training experience. And although some server-based learning management systems (LMSs) can sidestep bandwidth issues, their infrastructure and support costs can place them far out of reach for smaller to medium-sized organizations. Convergence Training Viewer solves this core problem of limited access to quality, affordable training by giving users an easy-to-use platform to download purchased training modules and play them locally, eliminating bandwidth concerns. Users benefit from the stable delivery of effective, engaging content for a superior training experience at extremely reasonable prices. “We’ve been looking forward to introducing a platform like this for quite some time.” says Randy Kohltfarber, Director of Product Development. “Our focus has always been on delivering the best, most effective training experience in the industry. Convergence Training Viewer eliminates the technical limitations we’ve dealt with for years. Now we can make our training material available to anyone almost instantly without the slightest loss in quality. It’s really a best-case scenario for us and our customers.” This platform sets the stage for collaborating with other computer-based education and training producers to distribute SCORM-compliant material. Convergence Training, a division of Capstone Technology, achieves First Place honors for Surface Miner Training software at MSHA’s Training Resources Applied to Mining (TRAM) Conference hosted by the National Mine Health and Safety Academy in Beaver, West Virginia. The TRAM contest is part of an annual conference spotlighting the importance and effectiveness of safety training for our nation’s miners. It provides an opportunity for mine safety trainers and others responsible for administering safety programs to gain valuable exposure to the latest training materials and technologies. With support from the Joseph A. Holmes Safety Association and the State Grants Training Program, both public and private organizations come together to exchange ideas, present safety training material, and exhibit products and services. Convergence Training’s Surface Miner Training software has attracted industry attention since its recent release this summer. Unlike other existing MSHA-related training, this product couples advanced, computer-modeled content with functional, intuitive administrative tools for MSHA’s Part 46 compliance. In addition to Surface Miner Training, Convergence Training has just released Convergence Training Viewer, a free software platform for accessing and viewing a library of digital health and safety training media in compliance with OSHA and MSHA regulations.